Over the years, Kenya has emerged as an economic powerhouse in the African continent. In unveiling his ‘Big Four’ strategy, the President of Kenya has made universal health coverage (UHC) a priority agenda for the policymakers as the country seeks to align economic growth with sustainable development. In furtherance of this objective, the first pilot phase of the UHC project will cover four counties. Upon completion of the pilot phase, the plan is to extend to the rest of the country over the span of 18 months, with the aim to reach a 100 percent coverage by 2022. While the initial steps to make UHC tangible have been taken, it goes without saying that the realisation of this goal is an ongoing resource-intensive journey. There are various instances where countries got on the UHC wagon and struggled to achieve this goal due to factors such as lack of a pragmatic approach and inability to differentiate the aspirational goals from the achievable goals. One of the effective methods for addressing these concerns is making decisions based on contextual evidence and prioritising key areas that require immediate attention. There are examples of countries that have been pioneers in achieving UHC and, following years of learning and reforms, have sustained their universal coverage. Thailand is an example of a country that successfully established UHC in the early 2000s and has ever since provided support and guidance to other developing countries in the Asian region to start or continue the journey towards UHC. African countries such as Kenya have recognized Thailand as a UHC champion and are eager to learn from the Thai experience. Over the past few years, several high-level meetings between the Government of Kenya and the Government of Thailand paved the path for collaboration in the field of healthcare between the two countries. 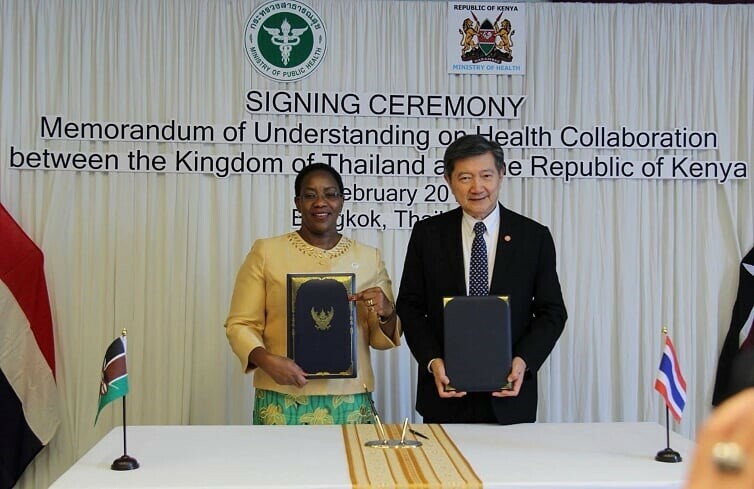 The informal collaboration between the two countries began with a study visit from a Kenya delegation to the Health Intervention and Technology Assessment Program (HITAP) at the Thai Ministry of Public Health in November 2018, and the collaboration was formalised with the signing of a Memorandum of Understanding (MoU) between the two countries by the Ministers of Health on 1st February 2019 at the Prince Mahidol Award Conference (PMAC) 2019. From 31st January to 2nd February 2019, a Kenyan delegation led by the Cabinet Secretary of Health Honourable Mrs. Sicily Kariuki, parliamentarians and other high-level officials from various agencies involved in the implementation of the UHC scheme in Kenya, visited Thailand. Day 1 kicked off with a meeting at HITAP where the policymakers learned about UHC in Thailand and the role Health Technology Assessment (HTA) has played in its implementation. This session was followed by a presentation on Kenya’s health care system and UHC implementation plans, and an open discussion. Day 2 started with an the PMAC 2019 conference where the Cabinet Secretary, along with other distinguished experts, presented and discussed on issues pertaining to the conference theme of Non Communicable Diseases (NCDs) during an interesting opening plenary titled “Political Economy of NCD: Players, Powers and Policy Processes”. This was followed by the signing of the MoU ceremony between Kenya and Thailand with high-level dignitaries in attendance. 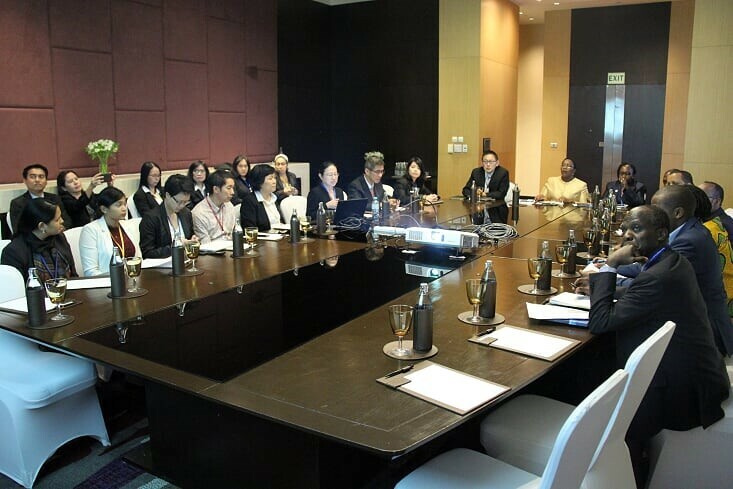 Later, the delegates participated in informative meetings with the champions of UHC in Thailand such as Dr. Suwit Wibulpolprasert, Prof. Walaiporn Patcharanarumol and HTA experts such as Dr. Yot Teerawattananon and Prof. Anthony Culyer, Chair of the International Decision Support Initiative (iDSI). Some officials from the Kenyan team also joined and participated in the Access and Delivery Partnership (ADP) meeting on “A Platform for South-South Exchange and Learning”. On Day 3, the delegation visited a health centre to learn about primary health care in Bangkaen, Thailand, and the National Health Security Office (NHSO) to understand how the Thai UHC Scheme is managed, including quality assurance through a call centre. The commitment with which Kenya has endorsed UHC is testified by the active participation of the policymakers in the discussions, field trips, and other activities. This collaboration shows that UHC in Kenya has taken root and achieving this UHC goal will be an exciting journey ahead. For more updates, please stay tuned! it appears the bangkok HITAP shall lead the universal health coverage mission in the african continent.